There are some movies that I watch without paying much attention to the story simply because they are too beautiful - "Moulin Rouge" comes to mind first as Baz Lurman's attention to detail (and awesome soundtrack) make that whole movie shine like a jewelry box. These movies are about seeing rather than watching. 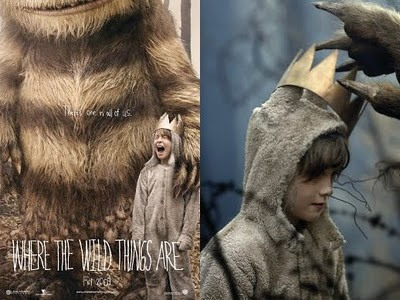 The movie I currently would like to see again is the very melancholy but entrancingly imaginative "Where the Wild Things Are." It makes me want to wear fox-like footie pajamas and a tin crown and run around in the depths of my mind (figuratively) climbing spheres woven of twigs and making friends with strange creatures. It seems to me that these visually inspiring movies not only grasp a hold on your eyes, but your ears as well. If you ever have a chance to sit and watch something that is not a real feel-good comedy, go rent a movie that seems to be brimming with beauty. Or "Little Miss Sunshine" which is a treat to see and a treat to watch.